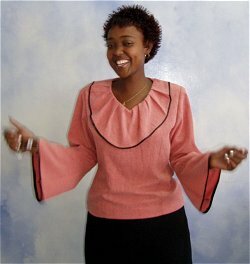 Salmon Flow is a well tailored cotton/nylon blend blouse designed by Grace at Elegant Designs in Nakuru, Kenya. Grace is modeling her blouse. She made several of these beautiful blouses. They have a 17″ back access zipper, shoulder pads to accent the waist, and 2 long darts front and back. The size 12 measures approximately 16″ from shoulder to shoulder and 22″ from shoulder to hem. The size 14 measures approximately 17″ from shoulder to shoulder and 23″ from shoulder to hem. The size 16 measures approximately 19″ from shoulder to shoulder and 24″ from shoulder to hem.